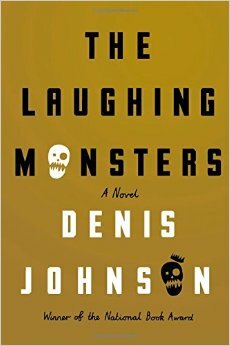 Denis Johnson’s The Laughing Monsters, was the first novel I’ve read by the author. I really didn’t know much about him or works like Jesus’ Son and Tree of Smoke. I was pleasantly surprised with the acclaimed writer’s latest novel for the majority of the read. However, the final part of The Laughing Monsters seems considerably less developed than what preceded it. Roland Nair is our narrator. He’s Danish, but still travels on an American passport. He does so because we’re in a post-9/11 world and being American still comes with a heavy punch. He’s in Freeport, Sierra Leone on a mission. Nair is tracking his old friend, and soldier/criminal, Michael Adriko. They used to scheme together, but now Nair works for a subsection of NATO and Michael is AWOL (he claims he’s just merely “detached”) from the United States 10th Special Forces unit a few hundred kilometers away in Africa. Not everything is as it seems. Nair is still scheming and trying to make money through less than desirable means and Michael left his post to marry Davidia. She’s the daughter of a US Army commander. His criminal activities are still alive and well, but it’s not entirely clear what they are. The basic premise of The Laughing Monsters is intriguing. It reads quickly and there’s a lot to take in. Nair loves alcohol and hookers. He’s intelligent and a lovely narrator. His insights into what and why things happen provides a unique voice to the narrative. It’s not just a thrilling action story without a lot of action, it’s an education. There are stones left unturned, which lends to a quick plot; one of the positive aspects of the book. The story leaves the reader questioning motives until the last act. Then the structure gets weird. Nair’s narrative becomes letters to Davidia and Tina, a woman he is somehow involved with back home. His voice doesn’t change, but how he presents information does. It doesn’t seem necessary. The structure change itself doesn’t hurt the novel as a whole, but it makes it less desirable. It is jarring and I found myself rushing to the end just to get it over with. It was rather disappointing, because I was so interested in Nair, Michael, and Davidia up until there was no reason to care. It became disjointed and scattered. While the earlier stones left unturned were welcome, the ending seemed unsatisfying in every way.